When you live off the land for generations, nature has a way of staying in your blood. So it’s no surprise that this family-owned company has come back to its roots. Our ancestors have made their living as farmers, dairymen, construction laborers, and craftsmen. They've irrigated corn fields, herded cattle, threshed wheat, and bottled fresh fruit. Along the way, they taught their children an appreciation for simplicity and natural beauty, and we hope that appreciation is reflected in the craftsmanship of the rustic decor available at mybarnwoodframes.com. Our mission is to connect people to home decor that is beautiful, functional, high-quality, yet simple. We want to help people create attractive rustic spaces where friends and families can connect and enjoy each other's company. Our dream to provide unique and quality products in the home decor marketplace became a reality in 2008 with the creation of our first website and our first sale of a set reclaimed barnwood picture frames sold to a local photographer. Soon, we began creating a variety of styles of frames and handled custom requests on a customer by customer basis. Sometimes it was a custom-size shadowbox made as a memorial to a favorite horse. Other times, it was a unique barnwood item like an outhouse-shaped toilet paper holder made of barnwood. As we refined our building process, we discovered we loved to create other unique styles with reclaimed wood, and our inventory and product offerings expanded. Our ability to provide stellar customer service is our core competency, so we have worked to become a company that provides quality product, on time, with a 100% satisfaction guarantee. If you are not satsified with your purchase, please contact us, and we'll work toward a resolution. In addition, we offer a variety of rustic frames and mirrors found nowhere else online but on our site. For these, we pride ourselves on craftsmanship, sustainability, and attention to detail. We have both standard and custom-made sizes. If you want an 18x48 inch frame, we'll build it for you! We pride ourselves on our ability to deliver beautiful, well-built frames at reasonable prices, with short turnaround times. We love helping customers locate unique rustic decor that enhances their experiences as families, and whether that is a unique frame for a beloved family portrait, or a sturdy farm table to host Thanksgiving dinners, we continue to look for products that reflect a way of life that combines simplicity with quality workmanship. As our company has grown, we continue to create relationships with other fine manufacturers, and make their products available to our customers. These include unique, customizable vintage-look wood signs, reclaimed wood furniture, unique western and wildlife metal wall art, framed art prints and photography, rustic wood birdhouses, and an assortment of unique coasters, candles, and other home accessories. 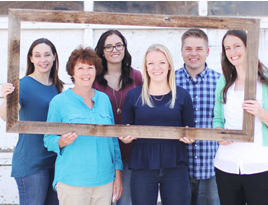 Part of the appeal of any Barnwood item is the fact that it has a story. Our frames are built from authentic reclaimed wood that is collected from all over the United States. The wood in your "new" frame could be decades old! Reclaimed wood is nostalgia itself. The wood we use to build your frame or mirror might have come from a dairy barn somewhere in Utah, or it might have developed its beautiful colors underneath the sun and rain in Oregon. Your table may have originally been planks in a tobacco barn in Minnesota, roofing materials from a blacksmith shop, or fencing reclaimed in Wyoming or Texas. MyBarnwoodFrames.com is the premier manufacturer of Rustic Barn Wood Picture Frames in North America, and a supplier of other unique rustic wood, western and wildlife decor, cabin furniture, and more.